For Valentine’s Day I wanted to give you a box of chocolates. 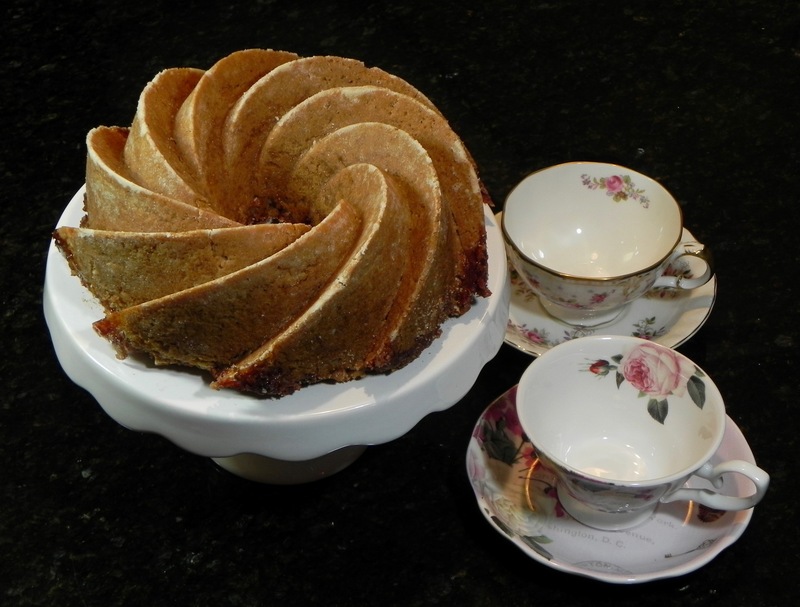 The recipe here includes ginger and cinnamon for spiciness and rose petals for romance. When you add in the chocolate you have an additional superfood to inspire passion and stamina. Melt chocolate in a double boiler ensuring that no water gets into the pot with the chocolate. Once chocolate has melted, fold in cardamom, cinnamon, rose petals, and candied ginger. Stir well and remove bowl with chocolate. 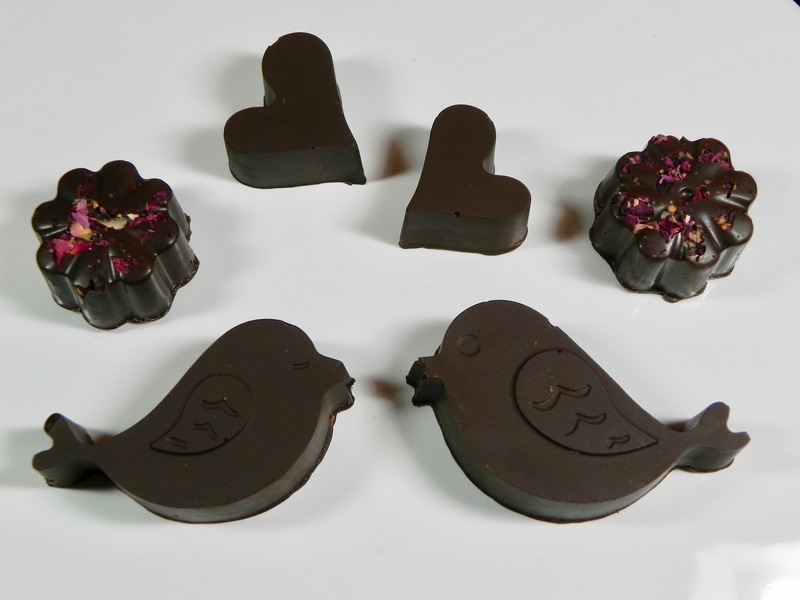 Pour chocolate mixture into molds, adding extra crushed rose petals to mold first, if desired. Smooth out with a spatula. Keep in fridge until hardened. Once chocolate has set, remove from molds. Until next time, happy un-baking! Upon looking over at the apples in my fruit bowl, I realized they weren’t getting eaten fast enough. 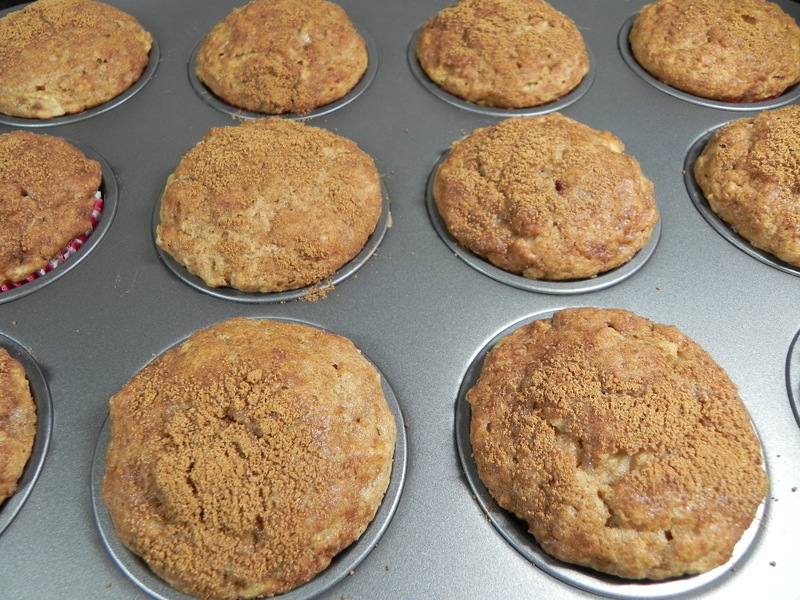 I needed to bake them into something quick so I decided to make Apple Cinnamon Brunch Muffins. That, and I had just bought Alisa Fleming’s book “Eat Dairy Free” and wanted to make a treat from it. The recipe was already already vegan and had high altitude suggestions, so I didn’t need to come up with substitutions for that. But, when I pulled out the ingredients from my pantry I realized that I didn’t have enough light brown sugar. To remedy that I used a combination of light brown sugar, dark brown sugar (which had too strong a taste to use on it’s own), and organic granulated sugar. The mix worked out great, and made muffins that were delicious with vegan sausage and tea. Preheat oven to 400F and line 12 regular-size muffin cups with paper liners. In a large bowl, combine non-dairy milk, applesauce, oil, and apple cider vinegar. Let sit for 10 minutes and then whisk together. In a medium bowl, whisk together sugars, flour, cinnamon, baking powder, salt, and baking soda. Add diced apple and stir to coat. Add dry mixture to wet mixture and stir until just combined. Do not overmix. Divide batter among muffin cups. In a small bowl, mix together 1 TBS light brown sugar and a generous pinch or two of cinnamon. 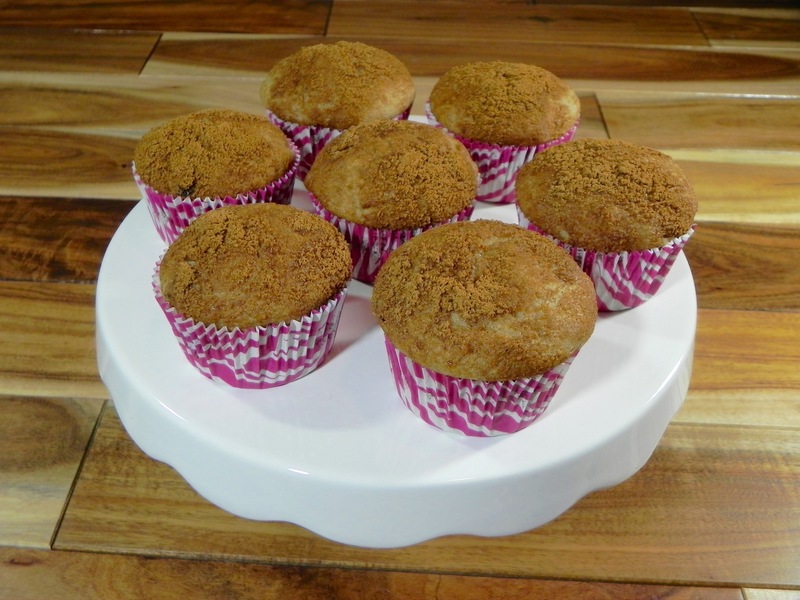 Sprinkle spiced sugar over muffin batter. The cups will be full. Bake for 20 to 22 minutes, or until a toothpick inserted into the center of a muffin comes out clean. Let cool for 10 minutes in the tins before removing the muffins to a wire rack to cool completely. Store in an airtight container at room temperature for up to 2 days. After last week’s post on baking bread, I was craving cinnamon bread. But, as I mentioned, I don’t do yeast products. 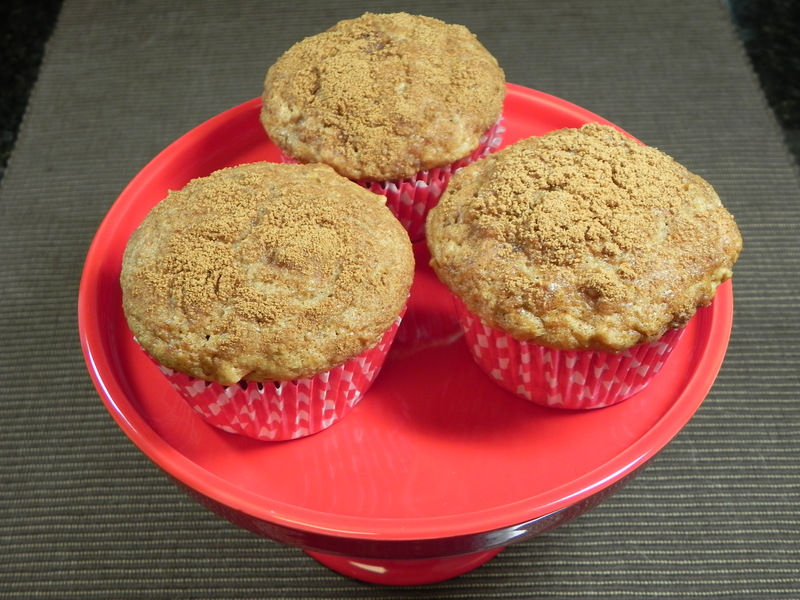 So, when I was scouring my recipe collection, one stood out – muffins based on cinnamon rolls. I could get my cinnamon cravings satisfied without proofing and kneading. Immediately I set out to make the rolls because they sounded easy and good. How good? Have you ever licked a (vegan) batter off of your fingers and then scooped more out of the bowl to eat? Yep, that good. The recipe was already vegan (I did say it was easy) so all I had to do was adapt for altitude. I added flour and milk while reducing the baking powder. I also used less topping so it wouldn’t suffocate a muffin trying to rise at high altitude. Because I had vanilla flavored yogurt, I reduced the vanilla extract. I didn’t want to crowd out the cinnamon flavor. They seemed to turn out pretty good, but I should taste test another one or two to be sure. Preheat oven to 350F and put paper liners in 11 cups of a regular muffin tin. In a small bowl, mix together topping ingredients and set aside. In a large bowl, sift together flours, cinnamon, salt, baking powder and baking soda. In a medium bowl, whisk together yogurt, milk, maple syrup, and vanilla. Stir in raisins. Add wet mixture to dry, stirring until just well combined. Distribute batter evenly between 11 muffin cups. Sprinkle topping on each. Bake for 18-19 minutes, until an inserted toothpick comes out clean. Remove from oven and allow to cool on a cooling rack. The Day of the Dead is a time to honor your loved ones who have passed on, and to have delicious sweets. 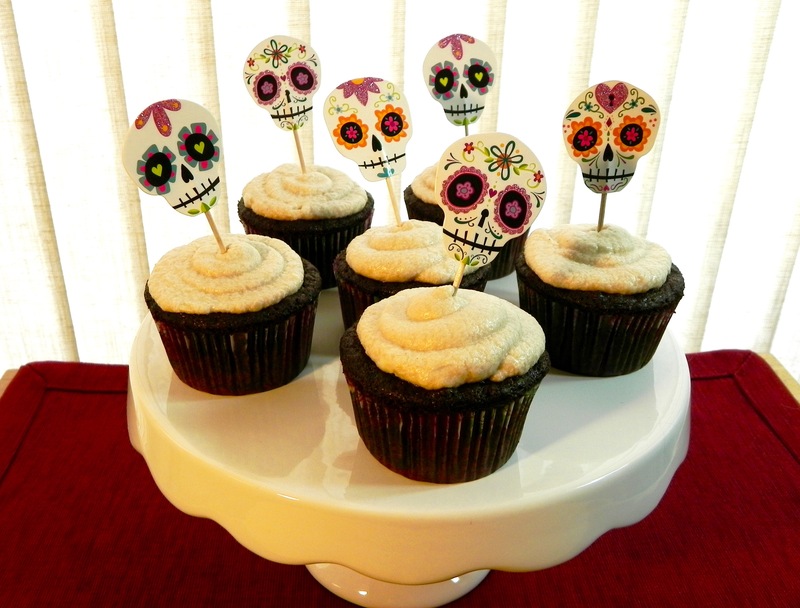 The sugar skull is an iconic symbol of this holiday, but I’m not an artist so I decorated cupcakes with pictures of sugar skulls. To add to the theme I chose the flavors of Mexican Hot Chocolate for a nod to the holiday’s roots in Mexico. My standby favorite chocolate cupcake recipe was used here, but I modified the flavors. The frosting was adjusted to add sweet cinnamon. Also, I added chipotle powder for the spiciness. How much you add is up to you – this could be a treat or a trick! For Cupcakes: Preheat oven to 350F and line a 12-cupcake pan with paper liners. Whisk together the milk and vinegar in a large bowl, and set aside for a few minutes to curdle. Add the sugar, oil, and vanilla to the milk mixture and beat until foamy. In a separate bowl, sift together the flour, cocoa powder, baking soda, baking powder, salt, and chipotle powder. Add in two batches to wet ingredients and beat just until no large lumps remain. Pour evenly into the liners, filling three-quarters of the way. Bake 18-19 minutes, until a toothpick inserted into the center comes out clean. Transfer to a cooling rack and cool completely. For Frosting: Beat the shortening and margarine together until well combined and fluffy. Add the powdered sugar and beat for 3 more minutes. Add the cinnamon, vanilla and milk and beat for another 5-7 minutes until fluffy.